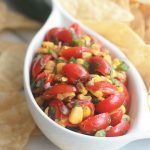 In a medium bowl, combine tomatoes, corn, onion, garlic, jalapeno, and cilantro. Add zest, lime juice and salt, stir to combine. Taste, add more lime juice and salt as necessary.